Who is it for? Colorbar Smokin’ Eyes Smudger Brush is for smudging kajals and liners but it can also be used to highlight inner corners of eyes are to cover blemishes with concealer. This brush comes in a black plastic pouch with vacuum sealing system. One can easily store the brush in its original package but I like to keep it in a brush pouch with my other makeup brushes. This particular brush is available in the individual pack and in a set of three different Colorbar eye brushes. The brush looks quite simple. It has a white plastic handle and a black bristle holder. The synthetic bristles are colored in vibrant red. The tip of the brush is tapered and dome-shaped. The bristles are densely packed. They are soft to touch but firm enough to do the smudging. I use my all-time favorite baby shampoo to clean it. I use my palm as the brush cleansing pad and clean my brush with normal temperature drinking water. This brush does not shed at all and its red color is still intact after cleaning it for 7-8 times. I have the entire collection of eye brushes from Colorbar and this smudger brush is my favorite from the set. I use it mostly for smudging the kajal from lower lashline and highlighting the inner corner. I do not like the too thick smudged look and this tiny round-headed brush gives a very thin yet perfectly blended effect under the lower lashline. I love strong highlights in my inner corner. For increasing the highlight shadow’s intensity I generally wet my brush tip first before picking up the shadow. Yes. I would recommend it for smudging liners or kajal for its excellent quality. Nykaa BlendMaster Eyeshadow Oval Brush : Yay Or Nay ? Angel Brush: Colorbar Brushes are Great! MAC Blush Brush Review – Is it Worth It ? 15 Heroines Without Makeup ! 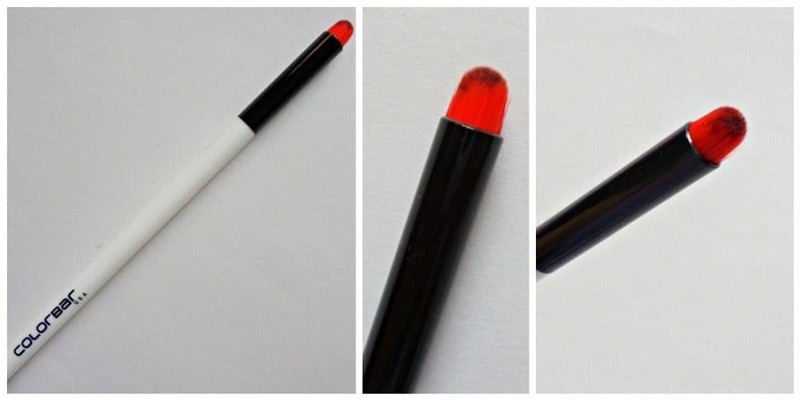 Colorbar Eyelluring Eyeshadow Brush – Should You Buy ?